Depending upon what items are currently in a specific location, moving other items into - or out of - that location may or may not be successful. The "Arrange Items" wizard is not magical. Code for each item, which can be moved, has to specifically support repositioning into any one of the target boxes. Any item move may, or may not, be successful. Various details may affect success. Other items in the same current location. Other items in the same target location. Post template status - customisation, etc. 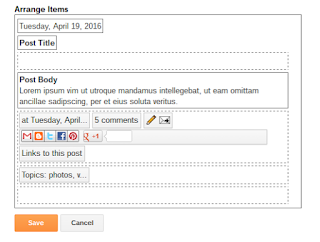 Frequently, when a problem with "Arrange Items" is reported, the blog owner is trying to target a position above the post body. Diagnosing a post template problem, which involves arranging items, can involve any of these details. Not so many blog owners want to re arrange items - and even less want to arrange items above the post body - so there is not a lot of experience with diagnosing these problems. Success - or failure - may involve several scenarios. In some cases, the drag and drop operation, in "Arrange Items", may not accomplish anything. The owner may drag the item into place - and watch as the item perversely moves itself back, to where it was. In other cases, the move may appear successful. The item may seem to move, and stay where is is dropped. The owner may Save - then refresh blog display, and see the item still where it was. Opening "Configure Blog Posts", the item may or may not be displayed where it is now - or where it is wanted. In some cases, the item may be moved successfully - and some other item, in the original or current location, may stop working. We have seen all of these problems reported. Frequently, there is only one course of action. In many cases, resetting the post template is the only way to repair a problem caused by moving an item to where it should not go. With the template reset, the owner will have to choose whether to try again - and risk a repeat, of the same problem. Moving #Blogger post template items, from one location to another, is not always successful - and sometimes causes problems with other blog content. Attempting to move items above the post body is a frequent cause of problems.